Setting good examples and modeling good behavior are priorities during lunch and recess periods at JFS. 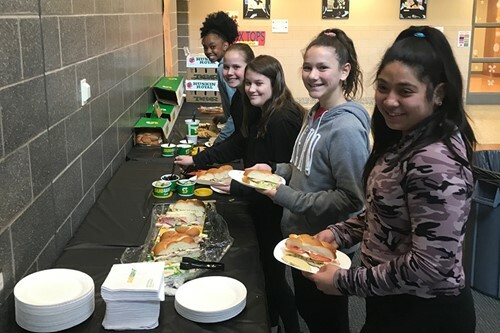 Students who demonstrated both were recently rewarded with a catered lunch from Subway for their model behavior in the lunchroom and at recess as part of the school’s Lunch and Earn program. Staff who see students exhibiting appropriate behavior and going above and beyond to help out give students tickets that are placed in a box. At the end of the month, names are drawn. Five students per grade level were chosen and each student invited a staff member who plays an important role in their education to join them for lunch. The lunch was set up in the main office lobby area and served by Principal Tim Lowie. Each month a different incentive is offered. Lunch and Earn is a collaborative grant effort using funds from a grant with the Union-Endicott Educational Foundation.